Ofcom has today announced areview of the retail marketfor standalone landline telephone services, to ensure that customers receive value for money. Overall competition in the telecommunications sector remains strong, with consumers getting better value for money in recent years (see chart 1). But Ofcom is concerned that people who buy landline services on their own are not being served well by the market. Our analysis shows that all major landline providers have increased their line rental charges significantly in recent years – by between 28% and 41% in real terms. This is despite providers benefitting from around a 25% fall in the underlying wholesale cost of providing a landline service (see chart 2). Price increases are felt most acutely by ‘standalone’ landline customers – those who do not have broadband or a pay-TV service. They do not benefit from strong competition in the market for ‘bundled’ communications – where landline, broadband and sometimes pay-TV services are packaged together. Ofcom’s analysis also shows that elderly and vulnerable people, who make up a significant proportion of standalone landline customers in the UK, are particularly affected by price rises (see chart 3). They are often very reliant on their landline, and more likely than most to have stayed with the same phone company all their life. Ofcom’s review will establish whether measures are needed to protect this group of customers. We are now analysing the market in detail and, depending on our findings, we expect to publish a consultation in early 2017. 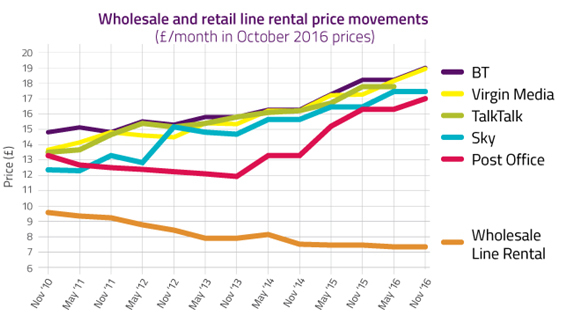 “Our evidence shows that landline providers have been raising the price of line rental, even as their costs have been coming down. In January this year, Ofcom published research it carried out with the Advertising Standards Authority on consumers’ understanding of how broadband prices were advertised, including the separation of line rental charges. Following this work, the ASA introduced new rules in October, which we welcome, requiring broadband prices to be clearer and inclusive of line rental. This may benefit customers taking bundles, and reduce incentives to increase line rental charges. However, it is unlikely to benefit landline-only customers – another reason that Ofcom is reviewing this market. The consultation relates to wholesale prices that BT can charge other telecoms providers to offer homes and businesses a telephone service over its copper network. Regulation resulting from the review will apply from 1 October 2017 to 30 September 2020. Call termination – the service used by a telecoms provider to connect their customers’ incoming calls. Today’s consultation closes on 28 February 2017.